Mystic hymns from Turkey’s rebellious Sufi poets. 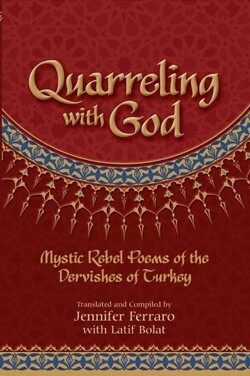 This collection presents, for the first time in English, a compilation of seven centuries of the mystic hymns of Turkey’s rebellious Sufi poets. At the time Rumi was writing in ancient Anatolia, many other great mystics in the region were also composing wild, ecstatic, and controversial poems that were shared among the people as spiritual songs. Many are still played and sung today in sacred dervish ceremonies. Poet Jennifer Ferraro and translator/performer Latif Bolat have organized the poems into insightful themes and also provide concise but essential cultural context that helps us swiftly join the rebels in their reverie. 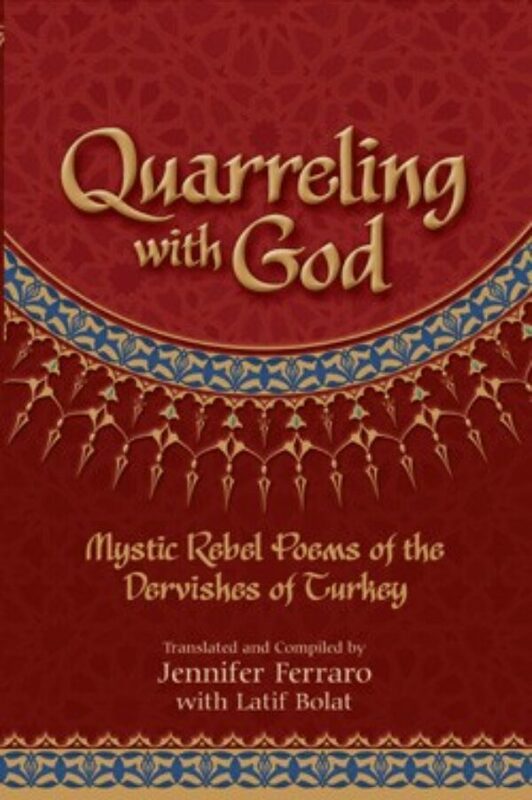 Quarreling with God welcomes us into a spiritual tradition from the Islamic world that bravely challenged orthodox religion and emphasized universal mystic love and tolerance. These songs reach across the ages to awaken your heart to our divine inheritance. “I have an insatiable appetite for reading on the Bektashi tradition and a growing interest in the “cabalistic” hurufiyya movement . When I learned that this book contained poems from a variety of Bektashi poets I knew I couldn’t pass it up. I wasn’t disappointed when I got a hold of it either. Everything about it is top notch! Even the physical qualities of the book (the cover, the materials used, text size and color , etc) are excellent. The poetry is of course what makes this anthology so endearing. I smashed the bottle of honor and virtue on a stone. What of it? Sometimes I rise up and watch the universe from above. Sometimes I go down to earth and loose myself in love. What of it? Sometimes I study life’s meaning in the holy books. Sometimes I go to the tavern and get drunk. What of it? The wine of this love is a sin, the orthodox think- The sin is mine. I fill my glass and drink, What of it? The pious bow to the niche in the mosque. I bow at the beloved doorstep, pressing my face up close. What of it?